We all have, at some point, come across a DRM protected file. Sure, it is great for you if your devices fall within the Apple family but if they don’t then too bad. Sharing and watching iTunes media has been non-existent for Android users, Windows users and all the others without Apple devices; until now. Tuneskit have introduced their new Tuneskit DRM Media Converter for Mac. This revolutionary software is famous for stripping DRM protection from movie purchases and rentals, iTunes videos, iBooks and Audio Books, and Music Videos and TV episodes. These files can be converted into numerous types of formats including MP4, MOV, MPG, AAC, MP3, FLV, SWF, 3G2, 3GP, MPEG-1, MPEG-2, and M4V among others. Now there is no reason not to watch or share your favorite videos or music with your friends. Better still, there is a trial version download at Tuneskit DRM Media Converter for Mac for you to get a feel of the features and functionality of this software. Digital Rights Management (DRM) is an enforcement technology that is primarily used to protect and preserve copyrighted and proprietary material. It does this by enforcing restrictions on access, modification, and sharing of said media. This is important especially for the owners to retain their artistic dignity and rights as well as guarantee perpetual payouts. Nowhere is DRM more pronounced than on iTunes. Most of the media on iTunes, especially entertainment media comes wrapped in DRM. The moment you buy or rent media from iTunes, you can only access it from iTunes or Apple devices. Clients have often been disappointed when they can’t access media that they paid for just because they are on Android or something else rather than Apple. The Tuneskit DRM Media Converter could not have come at a better time. This is proven by the over 300,000 users in just a short time. Users love that all the features and tasks that are promised by the Tuneskit DRM Media Converter are reached and surpassed. Here are the main features. Removes DRM protection from movies and TV media bought or rented from iTunes as well as iBooks and Audio Books, and Apple music from iTunes. 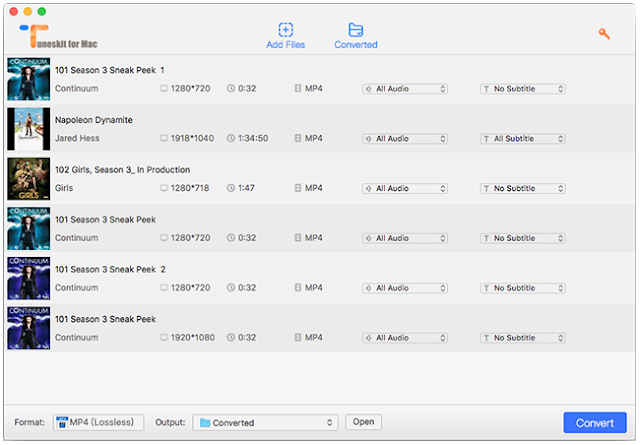 Converts and shares iTunes media while allowing you to watch them on Windows and any Android device that supports MP4 file format. The decryption technique of this software is unique, fast and smart. It is called the lossless decryption because none of the original quality of the media is lost. Users rated it the easiest, most trusted and user-friendly interface available. Especially the option to convert media in bulk. Tuneskit DRM Media Converter is compatible with Mac OS X Yosemite 10.10, Mavericks 10.9, Mountain Lion 10.8, 10.7, and 10.6. DRM Media Converter for Windows is under construction. The Tuneskit DRM Media Converter for Mac is incredible in the way it converts media while maintaining the original and/or bilingual subtitles, closed captions and 5.1 Audio tracks. This is done 30x faster than the span of the media which is roughly 20 times faster than the average converter. The quality comes in at 1080p HD resolution. It comes with great defaults more specifically the lossless MP4 and the lossless M4V for the user who doesn’t want to hassle. These defaults work well with the majority of devices. You can convert a video into Audio only. This is a unique feature that is worth noting. The user also gets to customize the output file as much as they want. 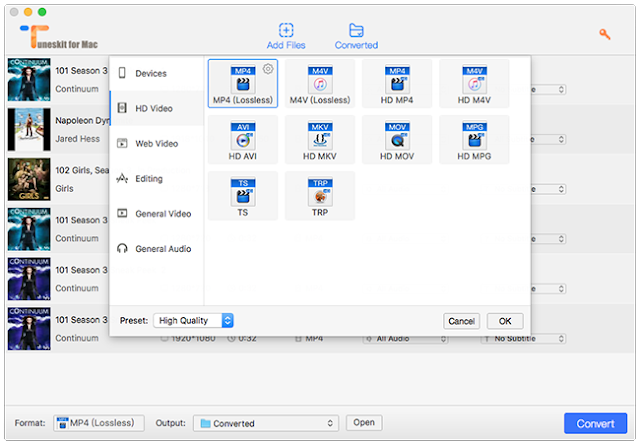 Options include video codec, video bit rate, and video size. You can also determine audio codec, audio channel, and bit rate among others. Tuneskit DRM Media Converter for Mac has frequent free upgrades and a Tuneskit Spotify Music Converter feature that gives you access to Spotify music, videos, and playlists. You can convert these media files to AAC, MP3, M4A, FLAC, WAC, and M4B at 5x the speed with lossless quality. As aforementioned, the Tuneskit DRM Media Converter for Mac is extremely simple to use. Here is a step by step guide. 2. To convert files, click the “Add Files” button and proceed to select your desired files from iTunes Library. 3. Now you can choose your desired format for the video. 4. Once you are done, click on the “OK” button to start the conversation. Message: I hope that you have enjoyed 'How to play iTunes movies on Android phone with Tuneskit DRM Media Converter for Mac' article on Tips2secure. However, if you want me to deliver more items, then please share my post. You can use Social Sharing Widget provided at the end of every post. After all, Sharing is Caring!